After what seems like a thousand years of blood, sweat, tears, and a lot more blood, your zombified disc disciples at Finders Kreepers unveil one of their most exquisite, exhumed, ectoplasmic, and existentially essential collections yet. 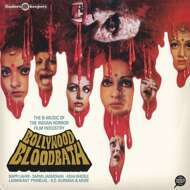 This musical mausoleum of malformed freak funk and dreadful discothèque pop has been resurrected from the maligned cinematic subculture of Bombay’s bloodthirsty horror film industry and witnesses the cognoscenti of the Bollywood pop scene at their most creative, destructive and experimentally effective. Bollywood Bloodbath features India's finest composers, such as Bappi Lahiri, R.D Burman, Sonik Omi, Sapan Jogmohan and Laxmikant Pyarelal making the kind of radical risk-rock that would under normal circumstances have studio security escorting these overworked maestros off set for a well-earned break or a relaxing exorcism. Take all the most oblique, indigenous characteristics of your favourite Bollywood musicals then condense them into a bubbling serum and watch the Jekyll and Hyde transformation commence as these A-list composers create bloodcurdling B-Music for the films they never thought the outernationals would see or hear. You've heard Italy’s most famous composers when they soundtrack unwatchable Roman slasher flicks with on their own uncompromised and underpaid terms? Well that blueprint just turned blood red with sub-shoestring, low-budget studio wizards gambling with rigamortis rock, disjointed disco and low-voltage electronics for seldom screened scenes of desi Draculas, lycanthropic lady killers and psyched-up swamp monsters. Ever wondered what the DJ would play in a 1981 luxury hotel that was built on an ancient Christian cemetery? No? Well it sounds like someone just got possessed by Jimmy Page and Nile Rogers at the same time. Help! But séance fiction aside the factual history of the untravelled Bollywood horror phenomena is fully re-exhumed with this compendium in true faithful Finders Keepers style. Carefully documenting the drummy theme from the first-ever 1949 Indian ghost film this benchmark collection follows the sinister lineage as directors of bloody thrillers take chances on shuddering synopsis and haywire sonic special effects. Leading up to the inauguration of the notorious Ramsay Bros film company (whose sibling revelry in the 70s and 80s lead to the inclusion of flight-style puke bags in participating picture houses) this compilation pulls no punches and plunges the 'B' of Bombay into the heart of the b-movie and squirts a masala of bloody ketchup and red wine onto the sets of Bollywood's glorious filmic musicals.